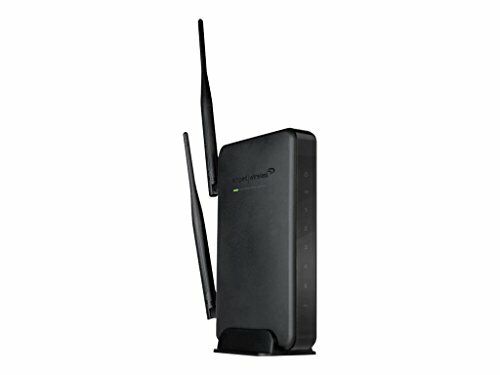 The High power Wireless-N 600mW range extender expands the range of any standard 802.11B/G/n wireless network by repeating the signal from a wireless router and redistributing it in a new "extended" location. The SR10000 is equipped with advanced dual amplifiers and detachable High gain antennas to extend Wi-Fi coverage by a staggering 10, 000 sq. Ft. The premium Series range extender features network bridging capabilities that allow additional networking devices, such as PCs and network switches to attach to one of the five (5) available wired network ports for network access. The premium Series range extender works with all Wi-Fi networks and is simply the most powerful universal Wi-Fi range extender on the market. Connect additional PCs, A/V devices, servers and printers. Please refer the Instructional Video or the User Manual & Guide before use. Connect your home theater A/V devices and game consoles by adding 5 wired ports. Please refer the Instructional Video or the User Manual & Guide before use.